Especially for visual cooks, all of 2011's recipes in one place. Do you have favorite recipes from 2011? Are any of these recipes still on your "to try" list? As the new year approaches, it's natural to look back, to reflect upon acccomplishments, to tally up the wins, the losses, the hits, the misses. Here's something I'm proud of. Late in 2010, I set out to better live up to the tagline I wrote for Kitchen Parade back in 2002, the one that still fits what I strive for today. "Fresh Seasonal Recipes for Everyday Healthful Living and Occasional Indulgences". How did I do? FRESH & SEASONAL RECIPES Check! Plenty of fresh vegetables and fruits here! All real food! New additions to the very popular easy summer recipes! Recipe inspiration for Easter, Mother's Day, Thanksgiving and Christmas. 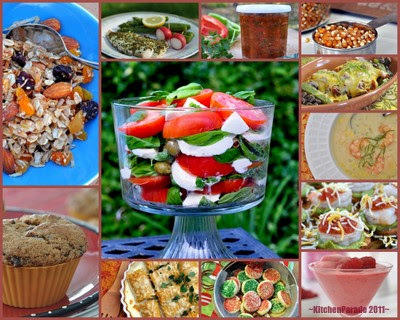 RECIPES for EVERYDAY HEALTHFUL LIVING Check! Lots of recipes for tonight's supper: doable, affordable, good to eat and good to our bodies, too. Vegan Done Real, the collection of whole-food vegan recipes from fellow food bloggers. OCCASIONAL INDULGENCES Until 2011, I let myself get carried away with sweet stuff – nothing like "other blogs" (you know the ones) but still. All too often, I was tempting myself and all of you with what should be "occasional indulgences". And so I quit. Without saying a word, I quietly let go of nearly all of the sweet stuff. Visually, it's easy to see below with all of 2011's recipes, row after row of "recipes for everyday healthful living" and only two of "occasional indulgences". Which recipes did you make this year? Are any on your "recipes to try" list? And more importantly, what would you like to see MORE of in 2012? and LESS of in 2012? Here's to focus! Here's to feedback! Since early 2010, I've been shooting with my much-loved Nikon D90 with a single 35mm wide-angle lens. Late this year, I started to shoot in manual mode and am learning to "find the light". It's still not easy but I'm getting there! Homemade Granola with Almonds & Apricots, Herb-Coated Broiled Fish, Homemade Sazón, How to Cook Popcorn in a Microwave in a Paper Bag, Easy Margarita Chicken, Sweet-Corn Soup with Shrimp, Easy Shrimp Bites, Sugar-Free Raspberry Bliss, No-Roll Christmas Sugar Cookies, Pumpkin-Stuffed Lasagna Rolls and Banana Nutter Muffins.